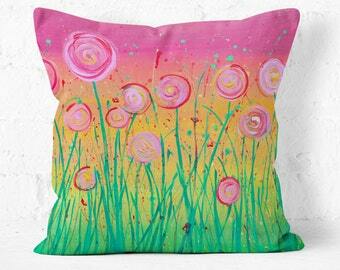 Colourful wall art, canvas prints, & accessories. Announcement Abstract and colourful decorative wall art for your home, by Louise Mead. Tree paintings, abstract art, and abstract wall art prints to brighten up your home. Abstract and colourful decorative wall art for your home, by Louise Mead. Tree paintings, abstract art, and abstract wall art prints to brighten up your home. Die Hülle ist klasse, sitzt eng, gleitet gut in die Tasche. Love this chopping board. Looks great. 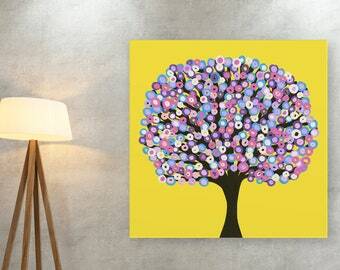 My yellow and grey tree canvas print in Northern Ireland Homes magazine. One of my pillows in this Monmouthshire County Life magazine feature. Stardust pillow in Staffordshire Living magazine. Working on the painting called 'Lily Pond'. When people ask me what I do, I still have to pinch myself when I tell them I'm an artist. Art was my favourite subject at school, although when I left education I ended up working in the IT industry, where I eventually set up my own business. As with a lot of people, a combination of reaching my 30s, and weathering the credit crunch led to me reassessing where I was in life, and I decided to make more time for my passions outside of work. I decided to do a Philosophy degree, and started painting again. My canvas habit soon got out of hand, and I realised I was going to have to make some space and find a way to fund my activities going forward. I decided to take the plunge and put my work up for sale online, and was lucky enough to sell my first painting within a week. To cut a long story short, I've been very fortunate in being able to give up my former career to work as an artist full-time. I currently work from my home studio, where I split my time between painting and being head-butted by my very affectionate cat, Dora. My work tends to fall into one of three categories - abstract expressionist, broken colour, and then the more representational abstracts depicting trees, landscapes, and flowers. The majority of my original works are created in acrylics on canvas although I do some mixed media works, and have been introducing soft pastels to a number of pieces. I've recently begun drawing again, having enrolled at my local college to help develop my technical skills. I've been experimenting with a variety of mediums during this time, and it's beginning to filter through in some of my work. People often ask me what inspires me, and it's hard to pinpoint one thing in particular. Music is one influence that comes to mind, I love listening to jazz music when I work. I find a lot of jazz really uplifting, and I think this is probably evident in a lot of my work. I would say another important aspect to my work is colour - as I've long been intrigued by the way colours can influence mood. I personally feel most inspired when I feel happy or hopeful, and I like to think that the vibrant colours in my work will help others to feel the same. My name is Louise & I'm an artist based in the UK. When I'm not being bossed around by my cat, I work in my home studio creating vibrant and colourful paintings and drawings. A specialist art gift print company. One of the leading artist merchandise production companies in the UK. Their products are tested according to the highest safety and quality standards. I chose to work with this company because of their impressive product satisfaction record, and expertise in dye-sublimination printing, which enables the printing of vibrant colours, in a more eco-friendly way than other printing methods. Prints are created and shipped directly to you by a specialist fine art print company, whose clients include the National Galleries in Scotland, Liberty London, and the National Theatre, to name a few. A specialist printer based in the UK. I design, and prepare the image before handing over to my print partner for production, quality checking, and shipping. Welcome to my shop and thank you for taking a look. It is my aim to produce art that is enjoyable to look and that will last well, at a reasonable price. If you would like any additional information on a particular product, please get in touch and I'll be more than happy to answer. I'm looking forward to working with you! I want you to be delighted with your order, so if you are not completely satisfied with your purchase, please get in touch. I aim to respond to all queries within 24 hours, although this might take up to 48 hours during busy periods. For standard orders, you have 14 days to return an item, from the date you received it. To be eligible for a refund, contact me with the reason you'd like to return the item, and I will be in touch with details of where to return your item to. Your return must be in the original packaging, unused, and arrive in the same condition that you received it. Buyer pays return shipping. For custom and one-off orders, refunds are only available in cases where the order has been lost or damaged by the courier. In order to make a claim for loss or damage by the courier, you need to inform me within 24 hours of receiving your order and provide proof of the damage upon request. This is in order that I can make a claim with the courier. You must provide proof of posting for any items you return. For larger or more valuable items, such as original paintings, or canvas prints, I will arrange a collection by my preferred courier in order to protect your refund and minimise your return cost. Once your return has been received, it will be inspected as soon as possible. You will be notified of the status of your refund as soon as possible after inspecting the item. This is usually within 24-48 hours. If your return is approved, you will receive a refund via your original method of payment. Your refund will be issued as soon as it is approved, although how quickly you receive it will depend on your method of payment, and your card issuer's policies. All printed items are made to order in the UK, and take 5 working days to produce. Shipping is done either by Royal Mail or FedEx, depending on the size of the item(s) ordered. Please note that shipping prices do not include local taxes and duty for countries outside of the UK/EU. So far I'm not aware of any of my shipments to the US incurring taxes or duty although I believe a small amount is chargeable to items shipping to Canada.